By providing many different recreation opportunities, the Recreation District focuses on improving the quality of life for our community. As an early kick off to summer we are opening TRY-a-TRI is Soledad's first mini triathlon! The swim, bike, run race will take place Saturday August 20, 2016 and only $35 to register! Race events and map are still being finalized but registration is now open and you can register at the Soledad Swimming Pool office. A mandatory race briefing will take place at 7:45 in the transition area. Can all competitors please ensure they have registered and racked bikes prior to this time. Access to the transition area will be from 7:00 – 7:45am. Transition will be located on the backside of building near Rotary Park. Bikes must be racked prior to race briefing at 7:45. The transition area is a one way system; please take note of the direction arrows below. Devices that could act as an impediment to hearing or concentration (mobiles, iPods etc) are not permitted during the race. Road or mountain bikes are acceptable, but must be well maintained and in roadworthy condition. A cycle helmet must be worn for the duration of the cycling discipline. The helmet must be put on BEFORE you take your bike from the rack in the swim-cycle transition and it can only be removed once the bike has been racked in the cycle-run transition. Cycles must not be ridden in the transition areas. Cycles must be mounted and dismounted within the designated areas immediately outside the transition zone. You must be aware that all of the roads will be open to normal traffic flows during the bike and run sections of the race. You must comply with the Highway Code. If you are overtaking a slower rider pull in once you are past. Goggles are essential; they protect your eyes from the water and improve visibility, helping you stay focused on the task at hand. Try out a few different types of goggles to see what fits your face best, making sure to select a pair with a proper seal. To test the goggles, hold them to your eyes, press the eye cups into your eye sockets and let go. A good fit will stay in place by suction alone. A swim cap keeps your hair from getting damaged, helps keep your goggle straps in place, and lowers water resistance. Both goggles and swim caps can be picked up at low cost in any sports store or the Soledad-Mission Recreation District. A triathlon-specific tri-suit is not essential, but you will require something close-fitting and comfortable, a singlet and shorts will serve you just as well. As mentioned above, a tri-suit or singlet and shorts can be worn, but extra padding in the saddle area is desirable. 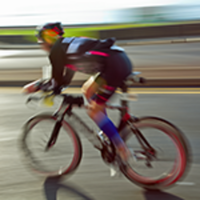 Helmets are mandatory; you’ll never see a triathlete riding without a lid, not even elite. New helmets are comfortable, reasonably priced, simple to use, and offer proven protection. A bike is an essential piece of triathlon equipment, but until you get to a more advanced level you need not worry about having a tri-specific bike, any bike will do. Be sure to give it a good service - check the tires, fill tubes with air or replace if need be, oil the chain, and check to make sure the brakes and gears are operational. Cycling shoes are a luxury if you’re just starting out, more important is having shoes that are easy to get on and off during transitions. The advantage of cycling shoes is that they attach to the pedals giving you better cycling stability and power. Again, there is no real need for investing specialized running gear at the beginner level. Swim, run and bike kit can double up; just make sure that the outfit you choose to wear is comfortable, even when you’ve been cycling in it. Breathability is always an advantage. Shoes are the most important part of your running equipment. If your feet are well supported and comfortable, it will make your run seem much easier. Consult a running shoe expert before you buy, as your foot-type and running style will dictate specific requirements.